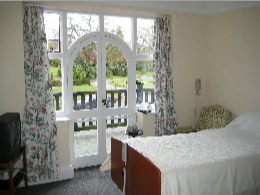 The College is especially well placed to provide short- or medium-term respite care. It is a place of quietness and spiritual peace which provides the ideal setting for care during convalescence after illness or surgery. We also welcome carers who wish to stay at the College along with patients, and those who may prefer to take “time out” in a prayerful atmosphere while their loved one receives alternative care at home. The College has single nursing rooms available for this purpose, all offering en suite facilities. Visitors are always welcome, subject to clinical needs. If you would like to explore this possiblity further, please telephone or click here to email the Warden to discuss your needs.